Only then can you decide if it was worth it. Nearly 18 years later, on December 20, 2016, the Dow hit another high, closing at 19,975. That’s our ending point. In about 18 years, the Dow rose 8,960 points. Was that rise in the market worth the risk? Inflation Risk: What is the possibility that the money you invest today might not buy as much in the future? Opportunity Risk: What if you could have done as well or better, with less risk, investing in something else, but you missed that opportunity because your money was in the market? Has the Dow kept up with inflation? Yes … if all you wanted was to put away grocery money in 1999 and have it be worth enough to buy the same amount of groceries today. If that was your goal, then the Dow did that, plus a bit more. But that’s only because of the market’s historic run-up in 2016, related to the presidential election. If you’d put your grocery money into a Dow Jones Index fund in 1999 and needed to take it out on February 11 last year instead of waiting until December 20, the value of your money would have decreased. The market gained, but not enough to keep up with inflation. That’s like trying to swim upstream and wondering why you’re not making progress. That’s your inflation risk. From November 2013 to February 2016 – a period of more than two years – the Dow actually lost ground, dropping 414 points. That’s your market risk. If your money were in a bank during those 2+ years instead of in the market – shucks, if your money had been under the mattress – you would have been better off. But who could know? The loss you incurred by being in the market – which kept you from putting your money in the bank or somewhere else – that’s your opportunity risk. From the date of its high of in 1999 to the high it reached in 2016, the Dow gained 8,960 points. So what was its growth rate? Over that period of nearly 18 years, the Dow had a compound annual growth rate of only 3.43%. What were you hoping for? Eight percent? … Five percent? If you believe radio broadcaster Dave Ramsey, you might have expected 12%, since Ramsey always claims you can get 12% in the market. But the Dow’s annual growth was only 3.43%! Was that paltry growth worth the stress and the stomach-churning, nail-biting ups and downs of the market for nearly two decades? Most people we’ve surveyed say 5% annual growth is the absolute minimum return they would accept, to put up with all that unpredictability and stress. If you had “bought the Dow” on May 3, 1999, our starting benchmark date, the Dow would need to be at 26,099 today, to have gained 5% per year. Of course, the fees and expenses associated with your investment (and you always pay fees and expenses– even in so-called no load funds) would have eaten into your profit, so you actually would have needed to reach something higher than 26,099, to net you 5% per year. Those Are Your Three Risks. What’s the Solution? The solution is a concept – a strategy – I call Bank On Yourself. Bank On Yourself is not an investment in the Dow Jones Industrial Average, or the stock market, or real estate, or precious metals. It’s not any kind of speculative investment. 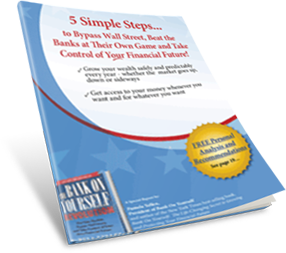 Bank On Yourself is based on a special kind of whole life insurance that many financially successful people have used for decades, but most people have never heard of. This is a very different type of whole life insurance from the kind most financial “gurus” like Suze Orman and Dave Ramsey talk about. With this variation, you don’t have to die to “win.” It requires a dividend-paying whole life insurance policy with some features added on to it that maybe one in 1,000 financial advisors understands. There is no market risk with Bank On Yourself, because you’re not invested in the market. Your cash value is locked in and guaranteed to grow by an ever-increasing dollar amount, year after year after year. Unlike the stock market, you can know the minimum guaranteed value of your retirement savings on the day you plan to tap into your account, and at any point along the way. No one can tell you what the inflation rate will be two, ten, or twenty years from now. But it’s good to know that the insurance companies recommended by Bank On Yourself Authorized Advisors have much of their assets in long-term investment-grade fixed-income assets like corporate bonds. There is no opportunity risk with Bank On Yourself. Once you’ve set up your plan, if you ever do find a money-making or investment strategy you want to take advantage of, you can simply borrow against your policy and invest in that strategy. And the money in your policy can continue growing, just as if you’d never touched a dime of it – if your policy is from one of the handful of companies that offer this feature. The Bank On Yourself method lets you know the guaranteed minimum value of your retirement savings on the day you plan to retire … and at every point along the way. You can stop worrying about when the next market crash will wipe out 50% or more of your savings – again. It’s easy to find out how a custom-tailored plan can help you reach your financial goals and dreams – without taking any unnecessary risk – when you request a FREE Analysis.